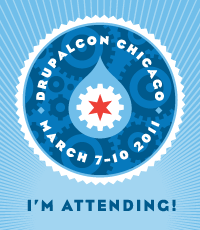 I'm halfway into my first DrupalCon in Chicago and I'm waiting for the Automated Testing and Drupal workshop to begin, so I thought I'd post a quick update on my time at DrupalCon. For the past few years Drupal has become the CMS of choice for DesignHammer. So much so, that we set aside the time to port our entire website to Drupal. We can finally say that we “eat our own dog food” now. Last night DesignHammer hosted the Coder Lounge for Triangle area Drupalers. A small group of us worked on porting several Drupal 6 modules to Drupal 7. We recently finished up development on a new Drupal website for Proteus Networks, a Juniper and Cisco network training and consulting company. The main challenge for the new site was to integrate Salesforce (a popular customer relationship management system used by over two million subscribers) with Drupal, the open-source content management system used for the website redesign.